All the lumber on this list is pressure treated. 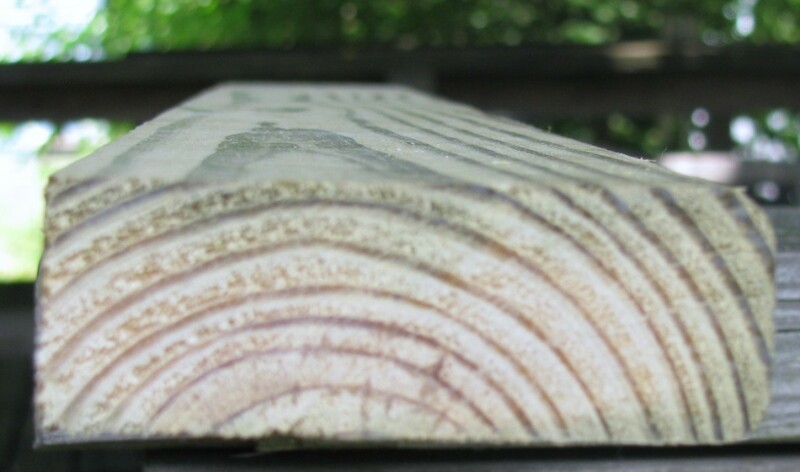 For a cedar or redwood deck the frame will still be pressure treated. Only the decking and railing would be cedar or redwood to keep the cost at a minimum. 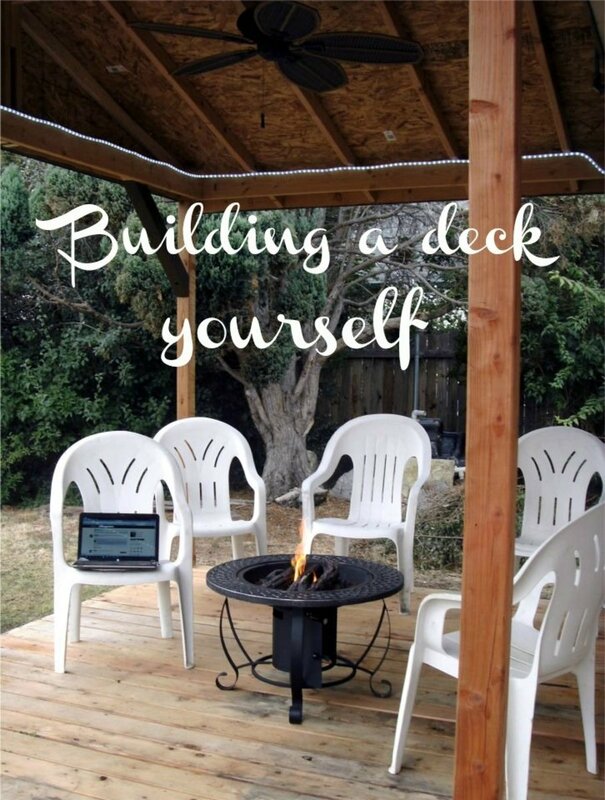 First build the deck in your mind. Imagine building it step by step. To be clear on the design, the material list and the labor estimate. We will go through the process now. We want to design the deck to fit the house and the land slope. We will use a simple 16 feet wide by 12 feet square design with one set of steps on flat ground. 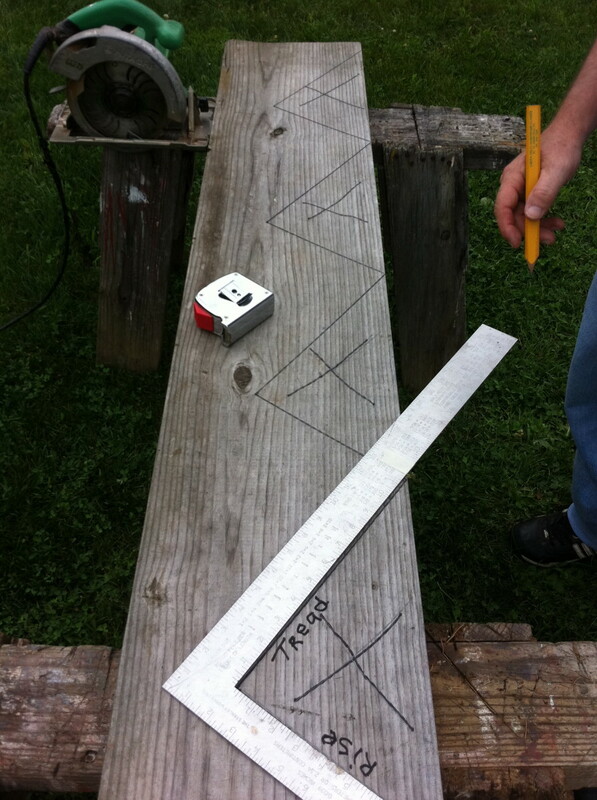 We want to measure the elevation from the ground to the top of our finished deck in three places. Measure the lowest point of the grade, the highest point and where the steps will be installed. We have a sliding door going into the house from the deck. It's best to keep the finished deck height a few inches below the bottom of the door to help keep out dirt, rain and snow. Let's say that our deck elevation will be 3 feet above the ground, giving us a 36 inch vertical height for the steps. Make a rough drawing that includes your measurements. Drawing it by hand will help you to visualize the deck and the building process clearly in your mind. If you like, you can get a free computer drawing and material take-off from any Home Depot or Lowe's. But, a store's computer may design your deck differently and use different lumber? You will need to study it and change it to fit your design. The computer's design may have some good ideas. But, I like to use my own simple drawing when building. You can copy our rough design and add the measurements to it. Now that we have our design and our drawing we need to do a material take-off to figure out the materials we need to build our deck. We want our deck to be secure and look great. So we will use a design that adds strength and style without using a lot of extra lumber. We will use our cemented 4x4 support posts as our railing posts. Our finished deck will have about 2 feet of space under it (between the bottom of the deck and the top of the ground). In the future we can use these posts (under the deck) to build a frame with lattice. Or using our example design, we could run just the corner posts and the stair posts into the ground and then notch and lag bolt our three remaining free-standing posts. We can put a little waterproof glue (Gorilla or Monster) into the notches before fastening the face boards. On a second floor deck we would use an entirely different design, to eliminate several of the posts under our deck. There we could use beams and a cantilever style that we can notch and support well. I like using notches and custom fitting pieces together because it adds strength and style. But notching and custom fitting is not required to build a secure deck, it's just a design option. 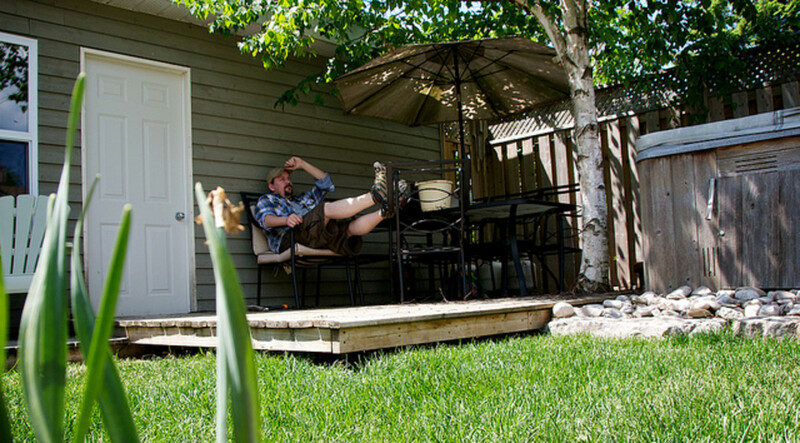 Designing and building a deck is an artistic expression. A way of adding your signature to your home, displayed for all to see and use. For our design we want to use 4x4 posts cemented every 8 feet and run them up through the deck to be used as the rail posts. Find the number of posts by measuring the running linear feet and dividing by 8 feet +1 for the end, plus one more post for the steps = 8. (Ex: 16' divided by 8 = 2+1. The sides are 12' divided by 8 = 1.5 for 2 posts on each side. This equals 7 plus one post for the steps = 8.) 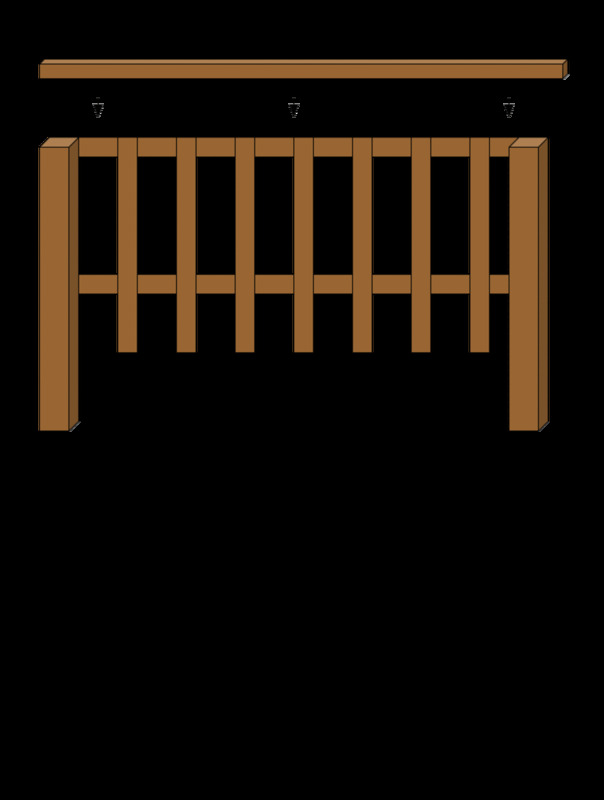 The stair post needs to be set 39 inches (center to center) from the corner post (leaving 3' between the two posts for the steps). Add two more posts at the bottom of the steps. This equals 10 posts. Find the length of the posts by adding together the deck elevation, plus railing height, plus depth into the ground. We have a 3' deck elevation + 3' railing height + 2' deep in the ground = 8 feet. Posts cemented into the ground need to be set 2 feet deep. A fence post that is not cemented would need to be set 3 feet deep with the soil tamped around it for strength. To support the weight of the deck we want to cement the posts. We need 10 posts for our deck, but the two posts at the bottom of the steps will be on the ground (deck elevation = 0) and only need to be 5 feet long. We will need 8 - 4x4x8' + 1 - 4x4x10' (2-4x4x5'). Because our deck will measure 16 feet wide by 12 feet out from the house, we do not need any center support beams. The 2x10x12' floor joists placed 16 inches apart will give us plenty of support. The deck is secured to the house with a ledger board. The ledger is fastened directly to the joists or studs of the house. Some homes have a built-in ledger or a band board that can be used. If not, we need to install our own ledger. We want to use a 2x10x16' board for the ledger, To install the ledger we need to remove a small section of exterior siding. Carefully remove the siding and cut a space for the ledger. Then nail the siding back after the ledger board is fastened into place. Nail the ledger to the existing studs or floor joists of the house. Use four lag bolts with washers for the ledger, one on each end and two equally spaced in between. We can use our waterproof glue here. Use silicon caulk to seal the ledger and the siding that we cut, to avoid any future leaks. We need 2 - 2x10x16' boards for this, one for the ledger and the other for the outside face board. To find the number of joists needed, multiply our width of 16 feet times .75 (16" apart) plus 1 (at the end) = 13 joists, plus 2 face boards (one on each end), bringing our total number of joist boards to 15. The 12 foot joist boards will need some extra support (at the center) to keep them from warping. So we want to add spacer boards between the joists and stagger them for easy nailing. Since we do not have many cut offs on this job, we need to either find some pressure treated scraps about 15" long or buy some extra 2x8's or 2x6's for this. We need 12 spacer boards, each measuring about 15" equals 180 inches, divided by 12 inches, equals 12 feet of lumber. The space between the joists will actually measure 14 1/2 inches allowing us to cut each board to fit snug. Fasten the joists to the ledger using metal 2x10 joist hangers. We can easily nail our joists to the outside face board so we won't need any hangers there. For the steps we need 1 - 2x12x16' to cut into three stringer boards. We find our stringer length by dividing our vertical height of 36 inches (from the ground to the top of the finished deck) by an average 7 inch rise and round it off to equal 5 steps with our desired 10 inch tread depth. Next multiply 5 steps times the 10 inch tread depth to find the length of the stringer in inches = 50. Our stringers need to be at least 50 inches, but we want to make them longer to make it easy to fasten the stairs to the deck. We can cut the 16 foot board into three equal pieces. We will cut the stringers to size when we fasten the stairs to the deck. We begin with our stringer boards measuring about 64" (16'/3). Our stairs will have 5 steps, each with a finished measurement of 38 inches wide by 11 1/2 inches deep on a 7 inch rise. The top step will be even with the deck allowing us to easily secure the stairs to the frame of the deck. We will use another 2x12x16' for the treads. We also need to install two support boards on our stair frame, one at the bottom and another at the top creating a rectangle box. We will use the top support to fasten the stair frame to the deck and the bottom support will be setting on the ground. We can use 2x6 lumber for these two supports, because they will be hidden when the deck is complete. 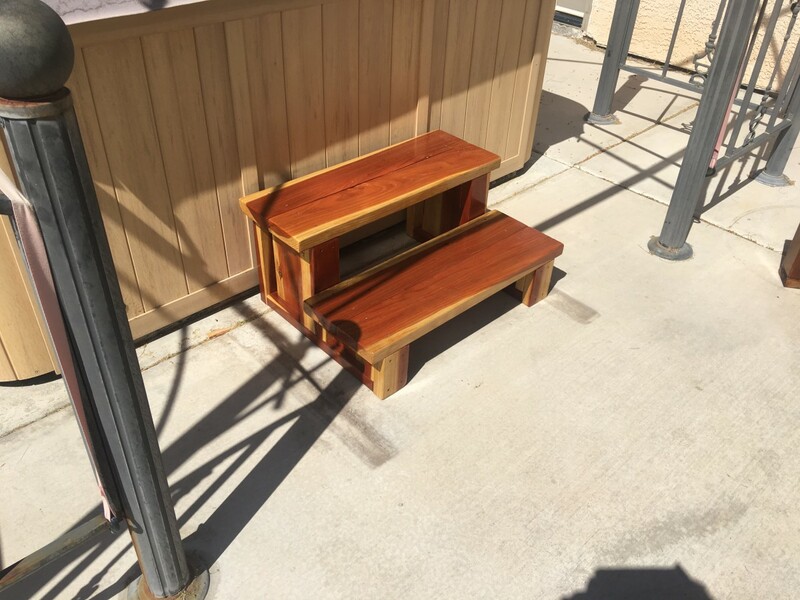 We could install 1x8 riser boards on the steps, but in this example we want to leave the risers open to give our deck a rustic appearance. Next, we want to figure out how many decking boards we need. There are two ways that we can do this. One way is to find the total square feet (length times width) of the deck and the square feet of a single decking board and then divide it out. To better explain our example we will figure it out the other way. Our joists will come 12 feet out from the house and the decking will run the 16 feet width of the deck (parallel with the house). We want our decking boards to overhang the frame by 1 inch for our design. We will easily get this 1" overhang when we notch the face boards of the frame into the posts on the front and sides of the deck. This will allow us to use 5/4x6x16' decking boards. First multiply 12 feet times 2 (6" wide) = 24 boards, but the boards are not actually 6 inches wide. They will measure about 5 1/2" inches wide with 1/8 inch gaps in-between for 12 feet = 24 + 3 (to compensate for actual board size + 1" overhang - gaps) = 27 decking boards. I suggest adding an extra board or two, just in case we run into an unexpected problem. So we want 28 - 5/4x6x16' decking boards. To find the measurement of our combined gaps multiply .125 (1/8" gap) x 24 (boards) = 3". The 5/4x6 boards are planed down at the mill to about 5 1/2" wide (add 2 extra boards every 10' to the 6" wide calculation). Last, we need to find the lumber for our railing. To find the railing measure the outside running feet and divide by the board length to get the number of boards needed. Then multiply running feet times 2 for the number of railing ballasts needed. We need two 2x4 boards for our railing to support the top rail and the ballasts. For the top rail you can use either decking boards, 2x6's, 2x8's or what ever you like. For our example we will use 5/4x6 decking boards as the top rail. We want our top rail and 2x4 rail supports to have as few joint seams as possible. We want to miter them, so they need to be slightly longer than our railing. For our top rails we need three 14 foot boards (one for each side of the deck and one for the 16 feet run minus the width of the steps), plus one 12 foot board for the stair railings (about 6 feet on each side of the steps). We will use the same lengths for the 2x4 rail supports. Outside to outside rail measurement is always slightly longer then the frame because the posts are 8 feet center to center. Now all we need is the concrete for our posts, nails, screws and the hardware. Use one 60 pound bag of pre-mix concrete per post hole, or one 80 pound bag for every two holes. We will need metal joist hangers for the ledger. We could make our own joist hanger by screwing a 2x4 along the bottom of the ledger and cutting a notch in each joist to fit. But, metal joist hangers will save time and are not expensive. Teflon screws are the best fasteners for the decking. I suggest using them to avoid nail pops and rust in the future. 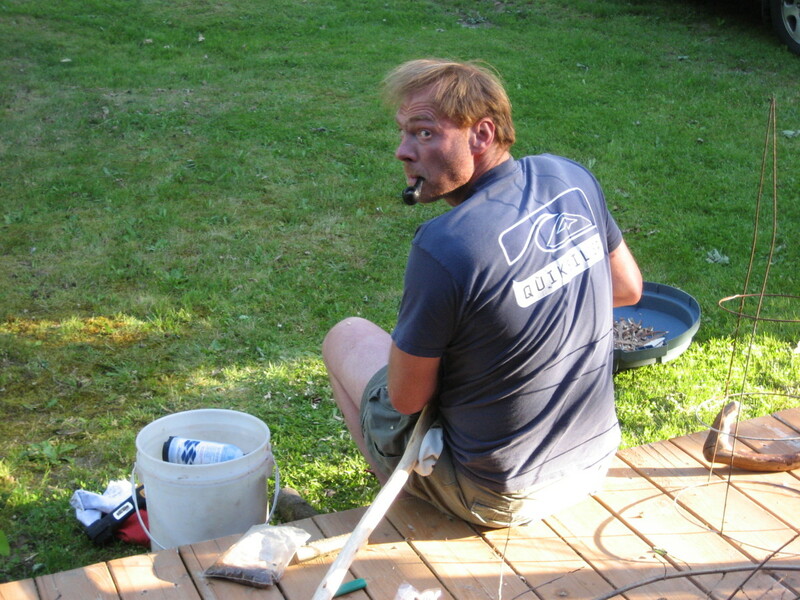 Fasten the decking with two screws at every joist. Use Teflon screws to also fasten the railing and the treads. We need about 20 lbs of 1 5/8" Teflon screws for the job. We need about 10 lbs of 16 penny framing nails and 24 - 3.5 inch lag bolts with washers (2 for every post + 4 for the ledger). 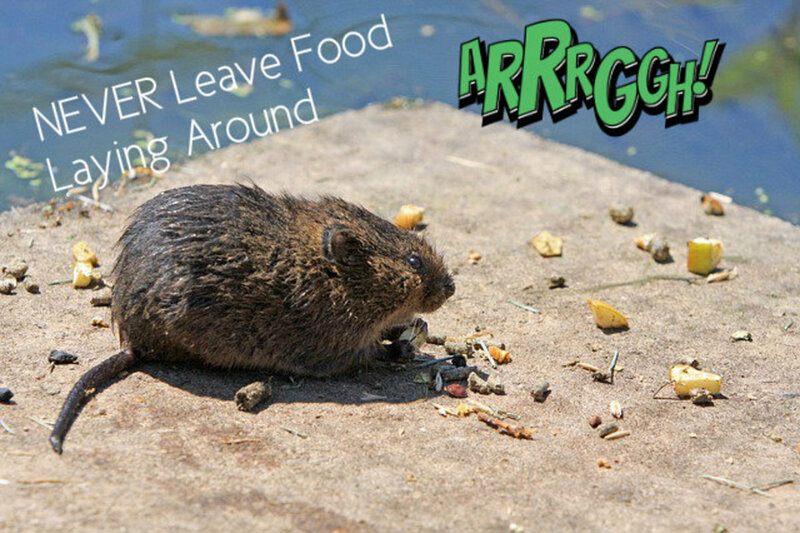 We also want a tube of silicon caulk to seal the deck where it meets the house. 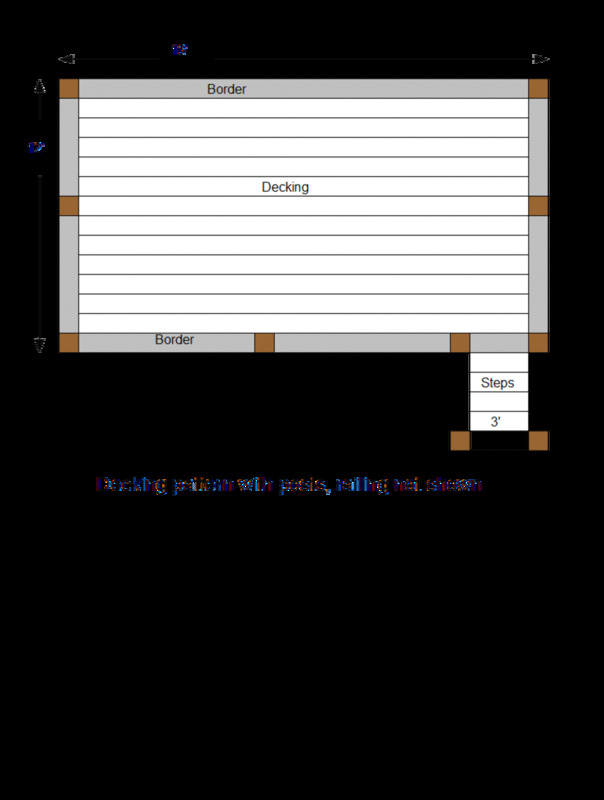 Now we have our material list with a clear idea what we will need and exactly how to use it. One last thing to keep in mind is how difficult will it be to get the materials to the installation site? Can a delivery truck drop the lumber next to our job site or will we need to carry it? 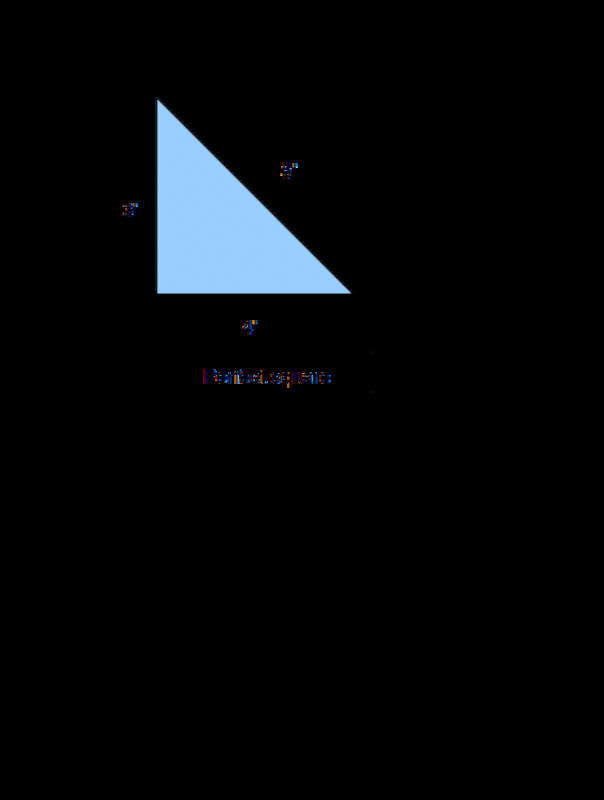 An old carpenter's trick is to create a perfect square by measuring one line of a triangle 3 feet long, the next line at 4 feet long and make the third line in between exactly 5 feet. This gives you two square lines, the 3 foot line and also the 4 foot line. A true square corner. To lay out the deck we will need to drive stakes at each corner and then run a string line to mark the posts in between. First we need to find a straight line. Drive a stake at one of the inside corners (at the house). To find a straight line and make sure our deck is square we can use an old carpenter's trick and then double-check it by measuring corner to corner across the deck, both ways. Corner to corner should be the same for both measurements. At one of the inside corners that meet the house we want to measure a triangle. First measure 3 feet along the house from the corner. Go back to the corner and measure 4 feet out from the house, make the remaining line of the triangle measure exactly 5 feet between the other two lines. This will give us a square corner to run our string line and find the position of our outside corner. Use the same method to run string lines around the perimeter of the deck and drive a stake at every corner, then drive a stake every 8 feet for each post. Equally divide the space between the posts that are less than 8 feet apart. Drive a stake 39 inches from the outside corner for the stair post. Measure 4 feet out from the corner and drive two more stakes for the posts at the bottom of the steps. These will also be 39 inches apart. Use a post hole digger to dig the post holes at least 2 feet deep. Dig a post hole at every stake. Cut the 4x4x10 into two 4x4x5 posts for the bottom of the stairs. Before setting the posts, we will use a C clamp to hold the face board in place to allow us to mark the posts where they will be notched to fit to the face boards. It will be easier to notch the posts before we set them. Before marking the notches, measure and fasten the joist hangers to the ledger. Then lay the face board into its joist hanger, level it and clamp it to the outside corner post where it will go. Measure and mark each post so it will be a few inches up from the bottom of the hole, leaving room for stones and concrete under it. Now mark the notches on the posts where they will meet the face board. Using a square draw a line at both the top and bottom of the face board to show us where to cut the notch into the post. Then cut the post between the two marks at a depth of one and one half inches deep (width of the face board). We want the finished post and face board to be even on the outside of the deck. Cut many thin slices into the post with a power saw and then use a hammer and chisel to clean out the notches. File them to a tight fit. The notches should be snug, but not so tight that they need to be forced together because the boards will naturally swell and shrink with the weather. To set our posts. First place the face board into its joist hanger and then level it and support it well enough to hold the weight of each post until we cement it. Throw a few small rocks and a couple shovels of concrete into the hole for a base. Then place the post on the wet cement using the supported face board as a guide, by inserting the post notch into the face board. Use a level to make sure the post is plumb and then nail it to the face board. Fill the hole with concrete around the post. After the posts are set, allow a day for the concrete to harden before building the frame. To build the frame you will either need a helper or use clamps and support boards. We already have our face boards in place and nailed to the cemented posts. Finish fastening the face boards on all three sides of the deck using two lag bolts and washers plus two 16 penny nails per post. We will fill in the rest of the joists by placing each in its joist hanger and then measure it in place and nail it to the outside face board. The frame goes together quickly. Install spacer brace boards between the joists near the center of the deck to stop any future warping or twisting. Stagger the spacer braces to make them easier to nail. Next, we want to lay out and build the steps. 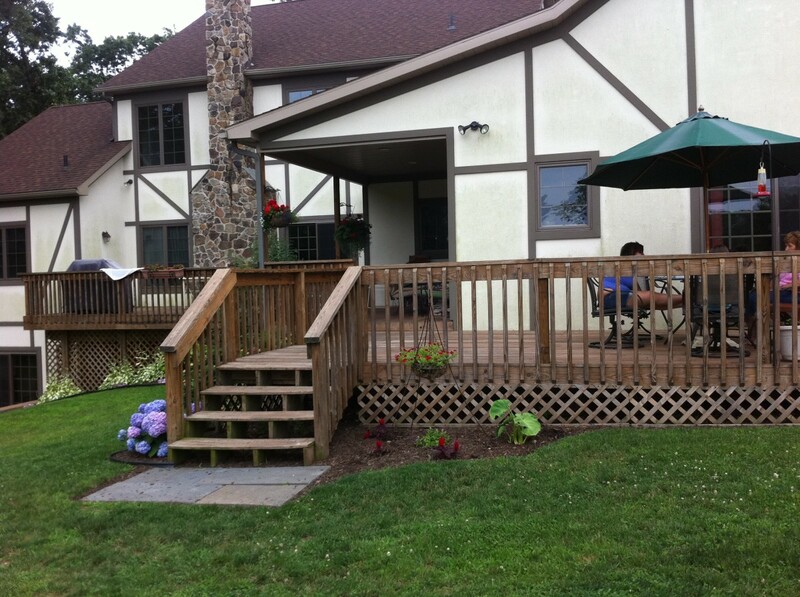 In this example we will install the steps at the outside corner of the deck. Using the corner post and the rail post that we set 39 inches over for the steps and also the two posts at the bottom of the steps (one on each side of the steps). Now we need to make our stringers. Doing the material take-off we found that our stringers need to be 50 inches, but we want to begin by making them longer. Cut 3 equal pieces from a 2x12x16', each measuring about 64 inches. Our vertical height from the ground is 36 inches and we will use a 7 inch rise because it is the rise our stair formula arrived at. Our 36 inch vertical height divided by 7 inch approximate rise equals 5.14. We have 5 steps and we are not left with a whole number. So, we must divide this number into our vertical height to find the exact rise and convert it into inches. We already know that we want our treads 10 inches deep and so we multiply that times our 5 steps making the stringers at least 50 inches long. We want to make them a little longer so we can custom fit them to the deck and to also allow a little room for error. For our example deck we will be using no riser boards. Before we cut our stringers we also need to factor in the width of the tread boards to keep our top step even with the finished deck. The tread board width is 1 1/2" so a 7 inch rise will need to be cut at 8 1/2 inches, which will leave the space under our bottom step a little smaller. But that's okay because we made our stringers long and we can adjust the steps with the bottom posts to bring it to the proper height. It's always good to leave your stringers a little long and then cut them to fit into place. 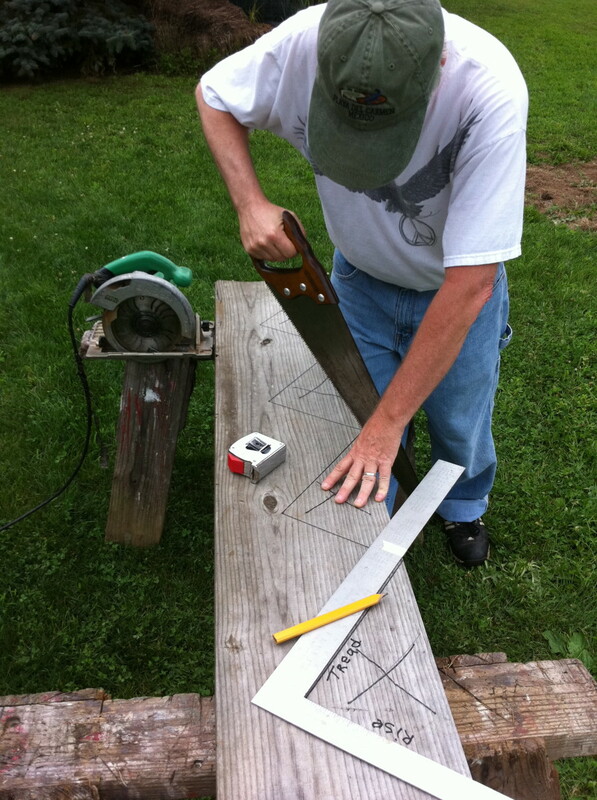 Using a 3 foot framing square, hold it to form a triangle on the stringer board. Measure 8 1/2 inches on the one end of the square and 10 inches on the other end of the square to draw the triangle. Draw the steps on the stringer and then cut them out. Mark each piece that will be cut away with an X, as you draw the steps. Because it can be easy to make a mistake and cut the wrong part off. We will keep the cuts as nice and clean as possible, cutting by hand the part the circular saw misses. The stringers need to be installed 16 inches on center. They will be fastened together using 2x6 supports at the top and the bottom, making a funny looking rectangle. Make the stair frame 3 feet wide from outside to outside. Fasten the top of the stair frame to the face board and then to the two posts at the bottom. Since we left our stringers longer we can notch each one and also notch the face board where they meet, to custom fit them into place. Make the notch in the stringer longer than the notch in the face board it fits into. The 2x10 tread boards will add the stength to our stairs. Install the treads after fastening the frame in place. Our treads will be slightly larger than the stair frame, allowing an overhang on the sides and front of each step. Our finished treads will measure 38 inches in length allowing us to cut 5 treads from a 16 foot 2x12. Center the treads on the steps leaving a one inch overhang on each side. For our design we want to Install a decking board along each 12' side of the deck, to act as a border. 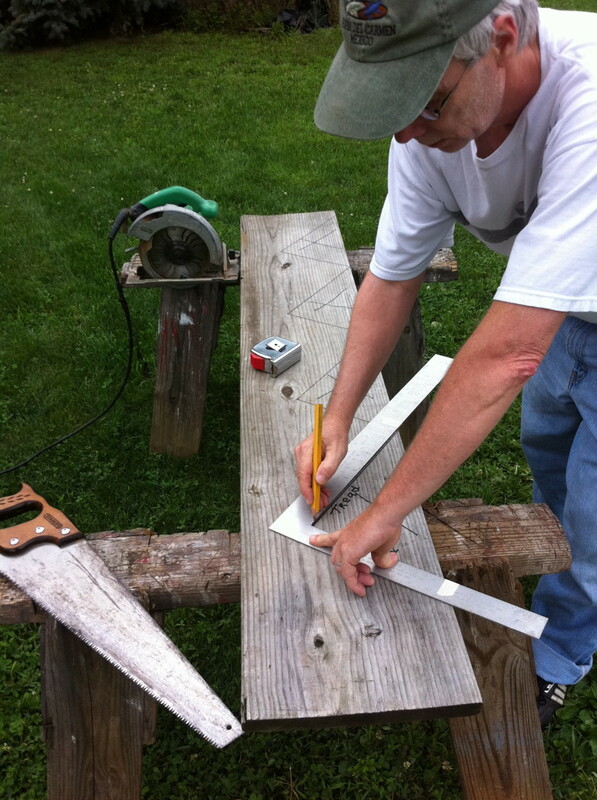 Mark and cut holes in the border boards to fit around the posts. Putting the posts into the square holes, slide the border board down the posts into place. The end of our decking boards will meet the borders. We want to lightly file the end of each decking board to match the edge of the border board. Install the decking with about 1/8 inch gap between the boards. The deck boards will naturally shrink with time causing the gaps to grow larger. Use a pry bar or thick nails as guides to keep all the gaps equal while fastening the decking. The decking is quickly screwed down with two screws on each joist. Pre-drill at all ends of the decking boards before screwing them down to avoid splitting. Also check how the grain runs on each board before fastening it. Decking boards naturally warp with weather. They need to installed with cupping grain down to avoid twisting. Finally we can install our railing. Railings are normally about 36" high. Measure the height of the railing and use a chalk line to mark and cut each post. We want to install a 2x4 at the top of our cut posts, fastening the flat side of the 2x4 to the post to support the top rail and the top of the ballasts. Place another 2x4 at 24 inches from the top of the railing to the bottom edge of the bottom 2x4, to support the bottom of the ballasts. The 2x4's are fastened to the outside of the deck posts, mitering the joint seams and the corners. As long as our deck is square the mitres will remain simple 45 degree cuts. Miter, pre-drill and screw these 2x4's onto the posts. Put a mark every 6 inches on the top 2x4 as the center line for each ballast. Pre-drill all of the ballasts and then screw them to the top 2x4. Then using a level, plumb each ballast before screwing it at the bottom. The 6 inches will not always hold out to the end of the rail sections. Adjust the last ballast at each end of the 8' rail section, to make those two equal distance from their post. The ballasts can be installed on either side of the railing. I like to put them on the inside because the top rail hides their edges, but either way is fine. Do the same for the stair railing. The only difference here is that the mitres will not be 45 degrees. We will have to find this mitre using trial and error with a scrap piece of lumber. Use the same mitre on both ends of the top rail and 2x4's on the stair railing for a finished professional look. Our deck is now complete. 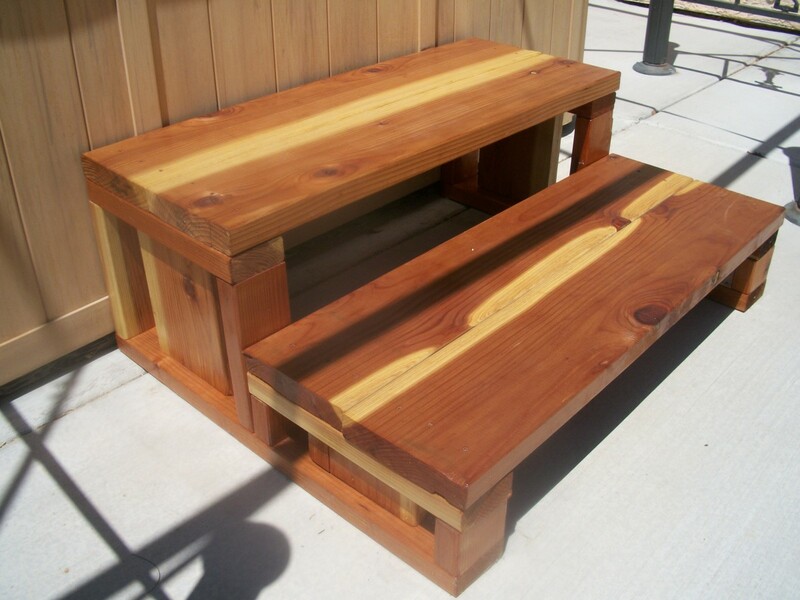 We should allow the new wood to weather for a month or so before applying any sealer or stain. Is the measurement the same for rooftop decks? Yes, for the decking, railings and stairs it can be the same. Supporting the deck may need to different, depending on your situation. Maybe using beams under the deck for support and then fastening the rail posts to the face boards of the deck. A deck 16' wide by 24' out from the house may need to have a stronger support design. Depending on how much weight you will need to support. Obviously a deck supporting a hot tub or a heavy arbor would need stronger support. Running a beam the width of the deck and under the floor joists across the center will add strength. You could create the beam using three 2x8's fastened together into one solid beam. It will depend on your situation and deck design used to properly determine exactly how many posts will be needed. Thanks for your interest. I want to know how many post do I need to build 24x16ft deck?